A company which has grown in fewer than five years to become a leading force in the Australian safety industry now plans to transplant its success formula into the huge US market. The General Mat Company – winner of this year’s Excellence in Sales and Marketing Award of the Parramatta Regional Business Awards - has built up the most comprehensive range of ergonomic, anti-fatigue and safety matting produced specifically for the Australian industrial and commercial market. "We have grown exponentially by firstly tapping into a market sector which was not being fully exploited, then secondly by forming strategic alliances with suppliers and distributors with outstanding attributes in particular market sectors," says company founder and Managing Director, Mr Michael Siegle. "GMC recognised that the huge growth in safety awareness in Australia was uneven. It was concentrated from the feet up – employers were kitting out people with helmets, goggles, gloves, jackets and boots, but they were sometimes forgetting about the floor they stood on. This is despite the fact that more than 7,000 injuries each year in the New South Wales workforce alone result from ‘falls on the same level’, according to figures from the WorkCover Authority of NSW, costing the one State $86 million. "It is estimated that 30 per cent of all accidents in the workplace today are the result of slips, trips and falls. Seventy per cent of these occur on flat surfaces - which isn’t surprising when you look at the poor state of the floors in some of our industries. It is now manifestly understood that every cent spent on protective clothing can be a total waste if an employee slips on a greasy floor beneath his or her steel-capped, heatproof boots," said Mr Siegle, whose company won the Peter Hudson Award for Excellence in Sales and Marketing in the Parramatta Awards, which are conducted by the Parramatta Chamber of Commerce and Industry in association with Rydges Hotels. The awards, for which 19 finalists were selected, are vigorously contested by companies from one of Australia’s major industrial and service company regions, Parramatta, which lies at the geographical heart of Sydney. Mr Siegle said the Parramatta award - which follows GMC’s Australia Post Business Achiever awards in 1998 and 1999 – confirmed the importance of clear business planning which firstly identified a market opportunity then laid out a clear strategy to attain it. "Through strategic distribution alliances aimed at key market sectors – including architectural, automotive, building, construction, engineering, food, government, hospitality, health, manufacturing, metal working, mining, petroleum and gas, retail and transport – we have opened up paths to markets which were wanting to achieve the best safety standards, but which weren’t always getting the product with which to do it", said Mr Siegle, whose company and the Australian Building Services Association (ABSA) recently exchanged letters of formal agreement on an incentive scheme giving ABSA and all of its 350 nationwide membership (and 25 associated companies) a discount on GMC entrance matting product sold following referrals from its members. BOC Gases has also concluded an agreement with The GMC to distribute products through more than 80 BOC Gas and Gear centres throughout Australia, complementing GMC’s specialist distribution through its nationwide network of distributors. Mr Siegle says excellence in distribution must be complemented at the other end of the supply chain by outstanding suppliers. His company has formed alliances with world leaders in their fields, with its performance making GMC exclusive distributor for The Andersen Company of Dalton, Georgia, USA, and the Tennessee Mat Company of Nashville, Tennessee, USA, producer of the Wearwell brand. The President of the Tennessee Mat Company Inc, Mr Elliot Greenberg, was in Australia recently to congratulate the GMC distribution network for helping the company to grow in a few short years to become one of the Tennessee Mat Company’s top 10 customers internationally. This year GMC was its leading distributor worldwide for the third consecutive year. GMC’s product list in Australia includes such internationally recognised brands as Wearwell, Waterhog, WeldSafe, Diamond-Plate, KleenSweep and WorkSafe. 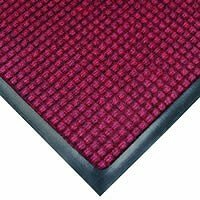 "Virtually every industry – hotel, industrial, government and private offices, warehouse, indoor or outdoor sites, chemical, food handling and processing, markets – have seen safety and cleaning costs reduced significantly by safety, anti-fatigue and ergonomic matting. "Huge developments in the safety levels expected by employees in the workplace kicked off demand in recent years but the momentum increased when it was recognised some of our range even reduces workers’ compensations claims and cleaning costs. "I guess we fill an obvious void in today’s safety-driven work culture. We can only get bigger," said Mr Siegle, whose recent marketing initiatives include a mat renting scheme as an alternative to purchase. To make the company’s products accessible to all levels of industry and commerce, clients can rent GMC products through its Flexirent scheme over a 24 to 36 month period. "Especially when you’re the leader, you can’t stand still. You always have to be standing in the customers’ shoes, seeing the market their way, and being the first to define and satisfy needs. The old days are gone when companies got a good distribution arrangement and sat back to wait for the money to flow in. Without good marketing, all that will flow in these days is water as your ship goes under."